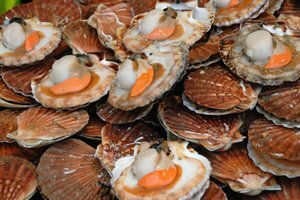 Below is a list of seafood recipes, submitted by our divers, of their favourite dishes using fresh fish and shell fish from Lyme Bay. If you would like to share a recipe with other divers at West Bay, please contact Keith, preferably with a photo of the finished meal (at least 300×300 pixels size). This is a simple dish to make but its all in the tasting like so many of my dishes. I don’t put amounts in many recipes as I cook by taste the best way is to start with the basics and try for yourself. Different cheeses, stocks, crabs etc will have different tastes so the only way to make a dish you love is to taste as you cook. Spider crab tastes best but brown can be used for an everyday meal. A brown crab is not expensive… should be about £4. Ingredients for the stock should be free from a decent fishmonger when you buy your crab. First make a really good seafood stock with flatfish bones, scallop frill and a few prawn shells. Season then add some gruyere and parmesan to taste… should be a nice balance of cheese and sea flavour. Fish stocks should be made with gelatinous fish, flat fish are great for this, also monkfish, don’t bother with salmon or oily fish like mackerel. Trim gills and guts (after the fillets have been taken off), I also use a lot of Squid and scallop frills when I’ve got plenty from a good dive trip! Prawn can be a stock on its own or add a little to fish stock… be careful as they can be very overpowering. Never add salt… never ever! 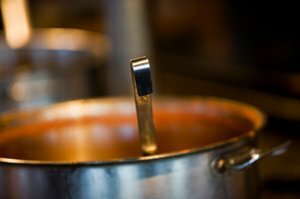 Season the meal not the stock, different meals take different seasoning so season towards the end of cooking. Bring to the boil then keep hot but not boiling or it will turn bitter, it is ready in 30-45 minutes. Skim if there is foamy scum on top. I then cool the stock, and leave in the fridge overnight to solidify any fat and scum before sieving and reducing, when sieving don’t force the fluid out if you want clear stock. The finer the sieve the better. Once sieved I think the stock will benefit from one final reduction, a rolling simmer till the flavour is concentrated, reducing volume by 30% or so. Freeze in portion sizes of about 1 cup. I freeze them in the ice cube bags, one ‘cube’ per portion as a rule of thumb. Peel and dice the potatoes and boil for 10 minutes. Meanwhile, finely chop the Garlic and Onion then slowly fry in butter to a light brown colour. Add plain flour until all the butter is absorbed, heat mixture and break up any lumps to get a fine, dry mixture. Quarter and add remaining Scallops and fry for a further 30 seconds (do not overcook! ), the Scallops should still be partly translucent. Add the milk slowly, stirring constantly until mixture is of the consistency of double cream. Add boiled potatoes and coriander to taste, simmer gently for 5 minutes before serving with fresh bread cut into large wedges for mopping up! If you haven’t got any Scallops, you aren’t diving enough! 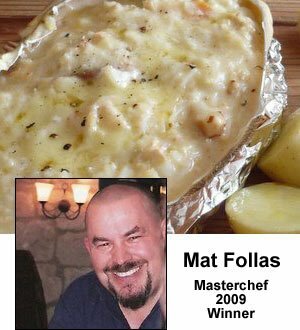 This recipe also works well with any firm fish (monkfish is good) or shellfish. Light the BBQ coals and wait about 20 min’s for grey ash to appear all over the top and flames to die down. Alternatively preheat a griddle pan on a moderately hot flame. Cut the large scallops in half, horizontally, to make 2 discs. Place a couple of herb leaves between two slices of scallop. 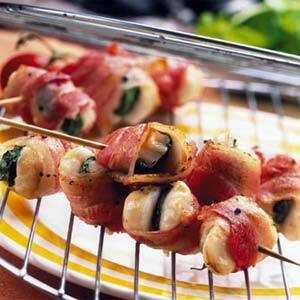 Cut a bacon strip in half and stretch one half around the scallops. Then wrap the other half of bacon across the first to enclose the scallop. Thread the scallops onto pre-soaked wooden skewers, brush with the garlic, herb or chili flavoured oil and place onto a prepared (foil-lined) barbecue or onto a griddle pan. Cook for 3-4 minutes, turning several times, until the bacon starts to go crispy. I cooked this for my dive buddies last summer on a throw away BBQ at the Freshwater Campsite, served on a bed of Tagliatelle with a tomato and Mozzarella salad… and a few bottles of Beck’s! Keith kindly supplied the scallops as I am useless at finding the things! This is a really quick easy recipe for scallops. Heat the oil in a heavy based frying pan until almost smoking. Add the scallops evenly with the ginger, garlic and chillies. Toss gently without stirring to prevent the scallops losing too much of their juices which will make them tough to eat. Then add the spices, fresh coriander and salt to taste, cook for a further 2-3 minutes. Serve on toasted brioche or fresh bread with a green salad.